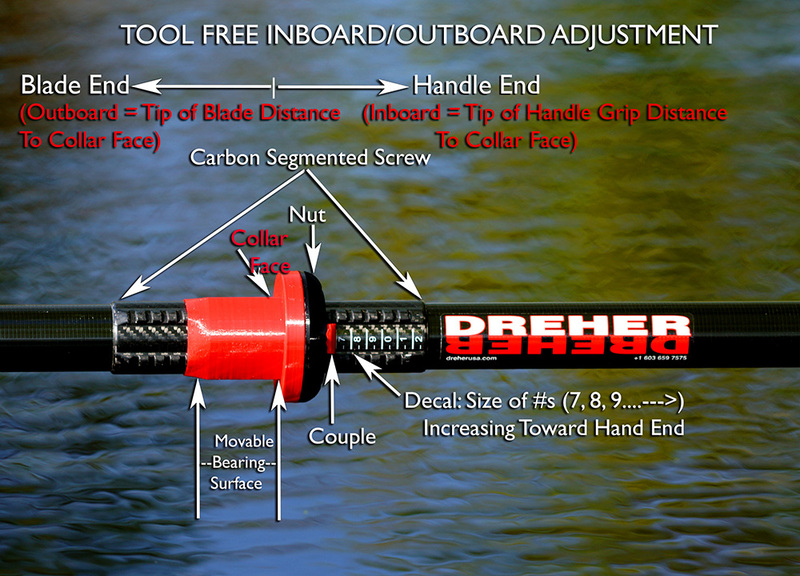 Mike Dreher has come up with a revolutionary design for a sleeve and collar system for oars and sculls. On par with the impact of the swivel lock which replaced thole pins over 100 years ago, this design allows quick and easy oar fulcrum adjustment (without tools) to increase or decrease the mechanical gearing of the oar outboard lever arm. 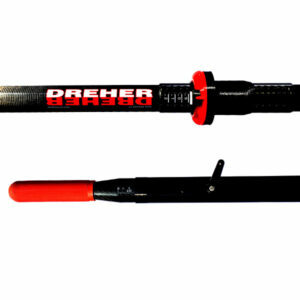 This is accomplished using a sliding replaceable bearing surface for the oar at the oarlock contact area. This new design solves the wear and pitch problem encountered with all existing sleeve/collars when selectively moving the collar to any location on the sleeve, such that each location provides a correspondingly different mechanical gearing for the rowing motion. 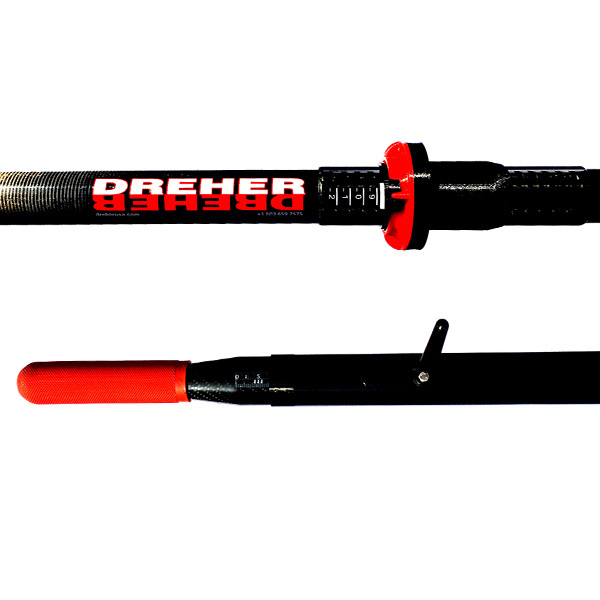 Current two-piece molded thermoplastic sleeves installed on the oar with a bonding agent, tend to twist and/or bulge during installation. This plus inevitable wear over time causes a non-consistent oar blade pitch angle, determined by the interface between the oarlock and the sleeve at the oarlock contact area, which then varies for different collar positions, adversely affecting the rower’s performance. Moreover, current design sleeves require the user to use multiple tools to reposition the collar which increases the complexity of changing the mechanical gearing, both on land and especially when in the boat. “Clams” partially address this concern by providing spacers that can be positioned on the outboard side of the collar. However, because the clams move the oarlock contact area to a different position on the sleeve, the problem of varying blade pitch angle is not resolved as is the use of different muscle groups unless the handle is also proportionally moved. This new design system requires a rigid one-piece carbon sleeve configured to become an integral part of the shaft portion of the oar. The outer surface of the one-piece carbon sleeve exactly mates with the wear collar bearing surface which can accurately slide to any longitudinal position along the sleeve. While the wear collar outer surface bears all the direct contact with the oarlock during the rowing stroke, the inner surface of the wear collar is shaped to linearly match a groove in the sleeve outer surface, such that the wear collar inner surface and the sleeve outer surface always maintain the exact same pitch about the longitudinal axis of the sleeve at any set position. The carbon sleeve is formed with a discontinuous helical thread (a segmented screw) along the sleeve outer surface. A “threaded nut” that travels along the discontinuous helical thread and positions the wear collar at any selected location along the sleeve by means of a coupler. This provides a sleeve and wear collar system for a scull or oar that is capable of being adjusted anywhere, including on-the-water, without the use of a separate tool because the adjustment mechanism is self-contained. The threaded nut is designed such that each 90º turn of the nut results in a quarter (0.25 cm) of a centimeter linear movement. Therefore one complete 360º turn of the nut, results in one centimeter linear adjustment of the wear collar surface. To prevent any unintentional change in position of the bearing surface a separate lock is provided that fits over a tab on the nut to prevent movement, which we call a “nut locker”. There is also a built in handle adjustment lever with the new system that completes the total “tool-free” adjustment feature of both outboard length and total length. All adjustable sculls are now offered with the standard adjustment or the new “tool free adjustment” as an option.